Retired Third Circuit Court of Appeal Judge Minos D. Miller, Jr., 85, died Saturday, July 1, 2006. He served as a combat pilot for the U.S. Navy during World War II where he earned a Purple Heart after he was shot down by enemy fire, spending 30 hours in the water and eventually captured and held in a prison camp. After being among the first Louisiana prisoners liberated and repatriated, he immediately began taking correspondence courses to continue his studies. In 1947, he received both his undergraduate and LL.B. degrees from Louisiana State University. Prior to his military service, he attended LSU and was a member of many honorary, scholastic and leadership organizations, including Phi Delta Phi legal fraternity, Omicron Delta Kappa leadership fraternity, and Phi Eta Sigma scholastic fraternity. He was first elected to the bench of the newly-created 31st JDC in 1953 and was re-elected without opposition in 1954, 1960, and 1966, serving as the only judge for that district during that time and earning recognition for maintaining a current docket with no backlog of cases while serving a population of almost 60,000. In 1968, he was elected to the Third Circuit Court of Appeal where he served until his retirement in 1977. He was a past president of the Louisiana District Judges Association and served on the Louisiana Judicial Council. He worked on various projects of law revision conducted by the Louisiana Law Institute and in 1967 served as a faculty advisor for the National College of State Trial Judges at the University of Pennsylvania. 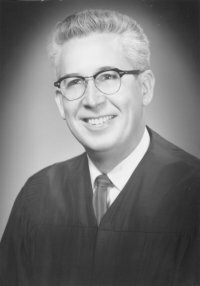 He served by special appointment on the Louisiana Supreme Court in 1958 and also by special appointment on the First, Third and Fourth Circuits of the Courts of Appeal. He was appointed by the Louisiana Supreme Court as an interim judge with the First Circuit Court of Appeal in 1961-62. He was active in a number of civic, charitable, and community organizations including service as commander of the Jennings American Legion Post, vice-president of the Southwest Louisiana Bar Association and chairman of the Jeff Davis district of the Boy Scouts of America, earning the Silver Beaver, one of scouting’s highest awards.